A primary concern in conservation is the extinction of species. Our work often leads us to ask: what should we do to save a species from extinction? The answer, or the search for answers, to this question spurs much of our research, our efforts. Yet, living as we are in the middle of an extinction spasm of the greatest import, we rarely ask the corollary: what should we do when a species does go extinct? In effect, when we fail to stave off an extinction? When a species passes on, should we just heave a collective gasp, drape a commiserative arm around our collective shoulders and move on to the next threatened species? Do we add another sample to the ever-growing database of extinct species for performing many-dimensional analyses of extinction that incrementally develop our knowledge of why species go extinct? Or should there be something more to it? For with the passing of a species, we also lose any connection we have once had with it. Take a parallel from human life―when a friend passes away, when a close relationship is no more. What do we irrevocably lose and how much? It is a kind of loss that defies quantification or commodification but, although difficult, it is not a loss that defies description or sentient perception. I realise that I am comparing the loss of species (non-human) with the loss of individuals (people). The loss of species presented this way conflates the loss of individuals within the species. Individuals that, in many animal species, have distinct identities and personalities and have to come to occupy the imagination and affections of the people who have studied or got to know them. In any case, one presumes that the appreciation of individuals lost when a species goes extinct can, if anything, only heighten the magnitude of loss. And it is this loss of a species including individuals of that species, with a sense of loss encompassing the connections we make, which should not be overlooked when a species is no more. This may not be easy, as others have said, in the timeless words that also inspired the title of this piece. And this we know, too, that the most enchanting of landscapes, to the discerning eye, may become bereaved and desolate with the passage of species. Expressions of this emerge from the best natural history writing and from poetry more often than from science or conservation writing. George Schaller conveys that deeper sense of loss with these words about the Himalaya. For epochs to come the peaks will still pierce the lonely vistas, but when the last snow leopard has stalked among the crags and the last markhor has stood on a promontory, his ruff waving in the breeze, a spark of life will have gone, turning the mountains into stones of silence. Everyone knows, for example, that the autumn landscape in the north woods is the land, plus a red maple, plus a ruffed grouse. In terms of conventional physics, the grouse represents only a millionth of either the mass or the energy of an acre. Yet subtract the grouse and the whole thing is dead. An enormous amount of some kind of motive power has been lost. In the poem, evocatively titled Longing, the poet Andrew Slattery conveys this, too. left swinging when the kids go in for lunch. The extinction of species, when it happens, may happen virtually unobserved. A species is there, or is declining, and, after a while, no trace is found of it in the wild. Often we see the causes, such as hunting or habitat loss or the crippling effects of an invasive species, that bring on the decline to the end. Only in exceptional cases do we know how the final blow was struck. This is probably true of the Great Auk Pinguinus impennis, a flightless penguin-like alcid bird of the North Atlantic, where the last two known individuals, on the lonely island of Eldey in Iceland, were strangled to death and their egg smashed under a human boot. One imagines with misgiving the last scene on desolate Eldey. Offshore, the longboat wallows in a surge of seas, then slides forward in the lull, its stern grinding hard on the rock ledge. The hunters hurl the two dead birds aboard and, cursing, tumble after, as the boat falls away into the wash. …The shell remnants lie at the edge of the tideline, and the last sea of the flood, perhaps, or a rain days later, washes the last piece into the water. Slowly it drifts down … down at last to the deeps of the sea out of which, across slow eons of the Cenozoic era, the species first evolved. We know, too, similarly of the extinction of the cheetah Acinonyx jubatus in India. 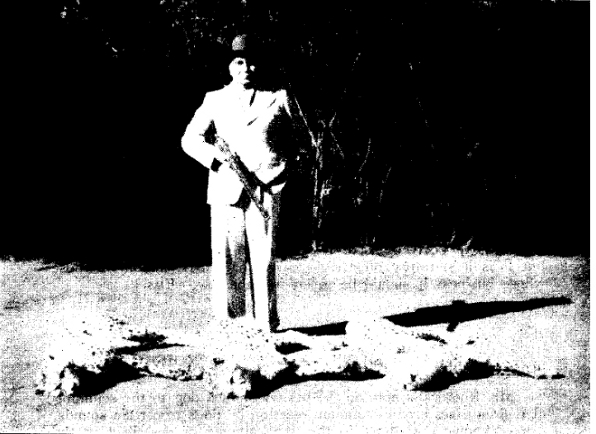 After a long and sorry history of appropriation of habitat for agriculture, of hunting and capture, the long history of the cheetah roaming freely in Indian wilds ended as the country gained its freedom in 1947. 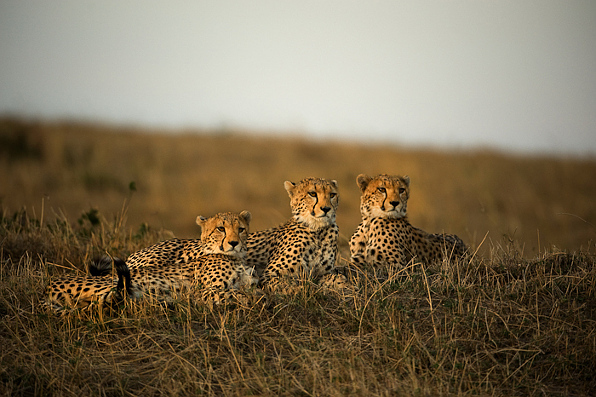 All these three cheetahs were shot by the Durbar in our State (Korea―E. S. A). He was driving at night and they were all seen sitting close to each other. They were all males… The first bullet killed one and … the second bullet after having gone through one struck the other, which was behind it, and killed it also. It is not known whether they were born in the State or had migrated from somewhere else. They were all of the same size, as you would see from the measurements and it is believed they were all from the same litter. There is no trace of their parents. They were in perfect condition. The editors were so nauseated by the account of this slaughter that their first impulse was to consign it to the waste-paper basket. Its publication here is intended in the nature of an impeachment rather than any desire on their part to condone or extol the deed. That anybody with the slightest claim to sportsmanship―and the general run of Indian princes justly prided themselves on that―should be so grossly ignorant of the present status of the Cheetah in India, or knowingly so wanton as to destroy such a rare and harmless animal when he has the phenomenal good fortune to run into not one but three together―probably the very last remnants of a dying race―is too depressing to contemplate. Further comment is needless. What adds to the heinousness of the episode is that the slaughter was done while motoring through the forest at night, presumably with the aid of powerful headlights or a spotlight. This, it will be recognised, is not only against all ethics of sport but it is a statutory offence deserving of drastic action by those whose business it should be to enforce the law.―Eds. That we have ultimately lost so magnificent a species to so pathetic a demise leaves me distraught. Decades have passed since, with little effort to sustain the cheetah’s memory in India or understand the effects of its absence on our landscapes, on our sentience, and on our lost connections. Like the Yangtze River dolphin or baiji Lipotes vexillifer, whose recent extinction has already relegated it a fading memory as people slip-slide away in their ever-shifting baseline of awareness, the cheetah, too, vanished from India in more ways than one. An entire generation has grown up in a cheetah-less nation, in landscapes bereft of its presence and its spirit. Now, an effort is proposed to bring back the cheetah to India, and a debate has ensued about the hows and whys of it. It strikes me that if one truly fathoms the sense of loss, what exactly we need to bring back will become clear. That one aspect confers an utility, if utility be desired, to this process of appreciation of a species that has gone from an area, but not yet from everywhere. On a wider canvas, many reasons to save species that are still extant have been articulated: there’s economics (the money), there’s utility (the products), there’s ethics (the right to existence), there’s aesthetics (the beauty), and there’s ecosystem function (the web of life). In the market-driven, utilitarian world of today, ecologists and conservation biologists are going full tilt at the first couple of these reasons, and entire fields of work in environmental and ecological economics has been spawned speaking of valuation of and payments for biodiversity and ecosystem services and there is talk of ecosystem marketplaces, of cap-and-trade systems, and sustainable use. This may be applauded as prudent or timely, as innovative or inevitable, and one can, with a little effort and a temporary suspension of a more fundamental awareness, even conjure a degree of acquiescence to its immediate conservation value. Yet, if we do not take the right lessons from the extinction of species, if we forget the connections we have lost, the palpable, irreplaceable voids that have been created, we risk making a deep error. An error that only dulls the mind and hardens the heart to reconcile ourselves to a more impoverished existence in a more inconsiderate, inhuman world. How eloquently written, Sridhar. Yet again, the ‘health’ connection that your post spurs is inescapable. Often, it is people who have felt a ‘connectedness’ with nature that have made a difference. After all, the arguments we choose (irrespective of their scientific merit) are mere means to an end; and quite often, we see that it is not always the most rational ones that see success. In market-logic rich days that we live in, it is easy to foist profit-driven “sustainable” models of health care, but at the end of the day, if a doctor is unable to feel empathy for the suffering he sees; if he is insensitive to the pains he is told about, often with no rational basis, but the fact that they are ‘claims’ made by a sufferer; if he is blind to note that the suffering is much beyond merely a disease, he reduces healing to a treatment and listening to hearing. Bereavement of a friend evokes a sudden gap…a severing of something that we can never fathom a life without……how do we cope with this? What is it to be bereaved of a species? Hmm..
PS: Ignore of course, the huge responsibility transferred to the “Good Lord” which (I hope) is metaphorical. Excellent post. Makes for lovely reading. This was a lovely read Sridhar.. And quite moving too.. Undoubtedly one of the best! A must read! I always feel all the conservation efforts cannot stop the extinctions ,ecological disasters but would delay the the worst to happen. Perhaps i may be a pessimist..
we will all be lamenting about the lost fortunes,lost worlds..
but nothing is going to stop our insensitivity,our “smartness” to see everything in economic value. Unless our common naivete towards our world change,our value system change, our living system cannot get changed..